As ususal, the Marmot has it covered. Go check it out. The Zaytun Unit, South Korean troops stationed in the northern Iraqi town of Irbil, took over operational command in the Kurdish-controlled region from the U.S.-led coalition forces on Friday, local time, a Defense Ministry official said. I think the writer meant to say "as part of" rather than "from" since Korean troops are there as part of the coalition. The article points out that the Koreans are not taking over security in their area, which makes sense since they are in friendly country. Local Kurdish forces will handle security while the Koreans work on construction. If Korean construction techniques back in the homeland are any guide, I fully expect all of North-Eastern Iraq to be lovingly covered in concrete by this time next year. Does anyone else out there see the dark humor in France making the list? (Kurdish Prime Minister Nechirvan Barzani) told Reuters the presence in Arbil of Iraq's contingent would benefit the entire region. "The new Iraq is in need of the international community's assistance, so we appreciate the decision of the South Korean government to come here," he said. In related news, concerns about attacks by Korean leftists has cause the US to impose a 9pm to 5am curfew on its troops in Korea. The locals (at least a few) are not grateful. Expect things to get really bad once the Korean troops in Iraq are attacked. The way they have been acting, the Korean left is begging for a terrorist hit on their troops so they can 'rally the masses' against the US. Their 'frog in a well' vision will skip over the local support that the Koreans have in their area in Iraq and say something like 'we stand with the people of Iraq against the arrogant Americans and demand that our troops be withdraw from their aggressive (road laying, bridge building, etc.) against the Iraqi people. Blah. Blah. Blah.' When that happens, we can expect some of the more unhinged members of the left to do al-Qaeda's work for them in Korea. I'm not talking car bombings, but the odd stabbing or fire-bomb attack is certainly possible. Does Korea not want to receive props? The Marmot and Oranckay have talked about President Bush not mentioning Korea in his nomination speech when he listed off some of the 30+ nations which are helping in Iraq. 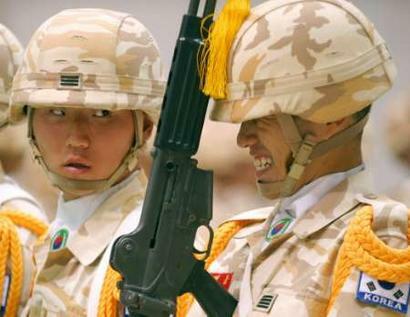 First, Korea is taking a very low profile in its deployment to Iraq. We just aren't hearing much about it. I think the thought here on the part of the Korean government is that they might be able to avoid terrorist attacks if they are not too conspicuous. Second, while Presidents Roh and Bush have worked surprisingly well together at times, Bush is the devil to many on the Korean left. Roh's government might not want to receive praise from Bush at such a high-profile event. Both America and Iraq have previously expressed thanks to Korea for its participation and I'm sure will thank it again in the future. However, if Bush's omission was an oversight, then it was indeed inexcusable. There is an English caption but I think the drawing speaks for itself. BTW, can you play 'spot the Japanese' in that drawing? While the Korean government doesn't seem to be too worked up about the omission, I think a quick call from the White House to the Blue House might be in order, at least for appearance sake. I think the crowd would have instinctively build up its applause as Bush went through the list. It would have also been a most eloquent rebuttal to the charges of unilateralism that are often laid against the administration. While there have been public send-offs for the Korean Olympians and the 2ID soldiers going to Iraq, the South Korean 'Zayitun' unit is now quietly deploying to Iraq. "There are some 550 members of the total 3,600 who are scheduled to be discharged in the coming months," said Lt. Col. Kang Deog-chan, an army spokesman. "Most of them want to go to Iraq despite the somewhat delayed dispatch by extending their draft term." 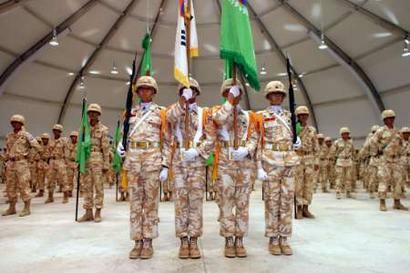 South Korea's Iraq-bound "Zayitun" unit, which includes highly trained elite forces and Arabic translators, have had their departure repeatedly delayed because of the worsening security conditions in Iraq. Kang said that only about 50 soldiers out of the 550 on the discharge list decided not to go to Iraq because of personal reasons such as attending college. If the government keeps the departure of the Zayitun Unit closed to the public as much as possible for fear of controversies over the troop dispatch at home, it's an act of crudity disparaging the justification of the troop dispatch, Had the government taken a dignified stance in the face of controversies, it would have been able to boost the morale of the troops and win public approval. Has the government fathomed the sentiments of the troops even once who have to go to the front line as if escaping from public eye, let alone being encouraged by the people? While I can see the point of keeping transit information secret, closing the departure ceremony to the public is just wrong. At a minimum, there should have been press coverage of the ceremony. They should have had a chance to receive their proper honors before the Korean people. Shame on Roh for sending those brave volunteers out like thieves in the night. I hope the Korean government will at least give them a proper, public welcome after they complete their mission and come home. PS, the Korean government has hired about 60 local militiamen to protect Korean civilians in the area. Once again exposing the hypocrisy of the Korean left, several hundred "peace" protesters took out their frustrations on the nearest riot policemen (who are always on hand to provide such stress release) they could get their hands on. I have at least one student who served in the riot police and will probably have a few more before I finish here, so I am a little sensitive about folks treating them like human tackle dummies. I just ask one thing: Folks, I know that the riot policemen work for the government, which you hate because of __________. Just remember that they are also kids who are doing their required national service. They are people's sons, boyfriends and students and they just want to do their service and get back on with their lives. So next time, at least use smaller sticks when you hit them. Protesters shouting "Down with Roh Moo-Hyun" pushed and kicked police who pushed them back using plastic shields. Similar scuffles erupted earlier in the day when hundreds of riot police erected a barricade with buses to block 500 activists and students from entering a military airport at the southern outskirts of Seoul. By mid-July 2004 the large-scale movement of equipment from the 2nd Infantry Division area to ports in southern South Korea was underway. There it was being packed onto ships and sent to the Middle East. Some 3,600 2nd Brigade soldiers were to deploy to Iraq by early August and meet up with their equipment once they get in theater. The polling company Research & Research said yesterday that 54.3 percent of 800 adults supported the troop deployment, while 36.7 percent of those questioned wanted the government to scrap the plan. The result indicated the Korean national's death in Iraq affected the public sentiment, considering that a previous survey conducted in April showed 50.2 percent of respondents opposed sending Korean troops to the Middle East country, while only 41.4 percent was in favor of the plan, an official with the polling agency said. As I said might happen couple of weeks ago, Kim Seon-il's murder has galvanized those Koreans who supported the dispatch while giving anti-dispatch protesters more of an air of desperation. This matching of passion, along with epiphany that Kim's murder may have caused for younger Koreans, has helped move public opinion on Iraq. Many Anglophone commenters on Korea, including yours truly, have often bemoaned what we have seen as naivety among young Koreans, brought on by being under US protection for so long that they don't know how dangerous the world really is. That naivety often caused them to behave as if the US was the cause of all of Korea's problems while overlooking Pyongyang's repression of its own people. It is a view that also causes them to see themselves as perpetual victims and to think that all the world would respect them for being so peace-loving and pure. But I have differed with some of my colleagues who seemed to believe that young Koreans' naivety was a permanent fixture in their collective psyche. Koreans are the same people who survived a brutal war and built a (usually) thriving world-class economy. They are the same people who sent two divisions to fight in Vietnam. Sure, the younger generation has been pampered and shielded from a lot of harsh reality, but they are still their fathers' children. This is heady stuff but we haven't really heard much of it and the "debate" among Koreans seemed to have been between "peace activist" and, well, nothing. Kim's murder has woken the other side up and the latest poll numbers show it. I am sure that future polls will swing back and forth as events in Iraq unfold, but at least now Koreans may have a real chance to debate their future place in the world order. I hope to talk about the latest rounds of the six party talks later tonight or tomorrow. There seems to be some positive developments. Noticeably absent from Friday prayers were some of the country's newest followers: a handful of South Korean soldiers who converted ahead of their planned deployment to Iraq. Last week before the beheading of hostage Kim Sun-il the troops turned out as they had done for weeks, shedding their boots at the mosque's doorstep to pray in camouflaged fatigues emblazoned with South Korean flag patches. The Defense Ministry said the Muslim soldiers didn't attend prayers Friday because they were attending training. But their absence underlined growing sensitivity over Seoul's plan to send 3,000 more troops to Iraq, making it the biggest coalition partner after the United States and Britain. In other news, the government is conducting an investigation after it was alleged that at least one Korean government official was notified a couple of weeks before Kim's killing that he had been kidnapped. Finally, I should note that yesterday was the 54th anniversary of the Nork invasion of South Korea. As the picture on the left (AP/Lee Jin-man) shows, some Koreans remember the value of the US-Korean alliance that was forged in the fight against a common communist foe. Like I have said before, I hold folks in the States don't base their impression of Korea only based on what Korea's university leftists say and do. BTW, the same woman is in the front of both pictures. I guess she is a leader of some group.